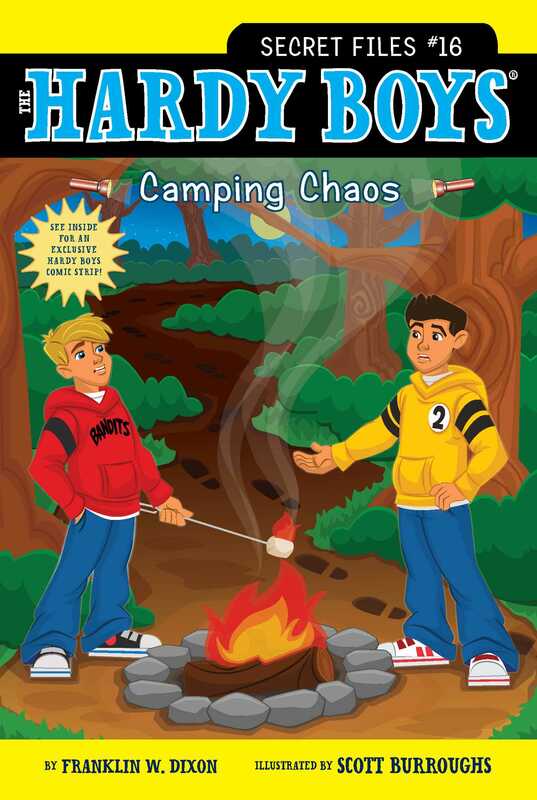 Frank and Joe do their best to avoid a camping catastrophe in this Hardy Brothers Secret Files adventure. Frank and Joe are excited to go camping with their friends in Bayport State Park for the annual “Fun With Camping” event. They are ready for hiking, bonfires, and s’mores—and especially for the tent decorating competition, which the boys are determined to win. But just a few nights into the trip, decorations start to go missing. First Frank and Joe hear strange noises outside their tent. Then they see a set of unique footprints at the campsite. It seems like someone—or something—is out to sabotage the decorating contest. Can Joe and Frank figure out who the campsite culprit could be? Dibs on this campsite!” Frank Hardy announced, setting his sleeping bag down. “Hey, don’t I get a say? We’re sharing a tent, remember?” his brother, Joe, reminded him. “Trust me. This is the perfect spot,” Frank insisted. “It faces the east, so the morning sun will warm us up. And there’s lots of moss and leaves, so it’ll be comfortable to sleep on,” Frank replied. “Uh-huh. When did you turn into Mr. Camping Expert?” Joe teased him. Their friend Phil Cohen set his own sleeping bag down about ten feet away. “Yeah, well, Chet and I picked an even better spot. We used the new camping app on my cell phone.” Phil loved apps, which were like computer programs. He had been obsessed with electronics since he was in first grade. “What’s so great about your spot?” Joe asked Phil. Mr. Hardy was Frank and Joe’s dad. He had brought the four boys to Bayport State Park for the annual fall Fun with Camping weekend. There would be hiking, canoeing, animal tracking, a tent-decorating contest, and other cool activities. Frank pulled his camping book out of his backpack. He opened it to chapter 3, “How to Pitch Your Tent.” He and Joe had pitched tents before, but it was good to get a refresher. The brothers worked efficiently. First they cleared the ground of any rocks and branches that might dig into their backs while they slept. Next they laid down a tarp and smoothed it out with their hands. The tarp was waterproof and would prevent rain and other moisture from seeping in. After that they inserted metal rods into their tent and popped it up. They set the structure upright on top of the tarp and staked it into the ground using a wooden mallet. Finally, they arranged their sleeping bags, lanterns, flashlights, and other equipment inside. When they were done, Frank stepped back to admire their work. It was a perfect home away from home—for the next two nights, anyway! Their dad finished pitching his tent on the other side of Frank and Joe’s. Phil and Chet finished pitching their tent too. Then the five of them grabbed their water bottles and set off for the welcome meeting. They took a narrow dirt path that meandered through the sun-dappled forest. The leaves on the trees blazed red, gold, and orange. Squirrels scurried around, busily collecting acorns. The air was cool and crisp and smelled like apples. Phil took lots of pictures with his camera phone along the way. At the end of the path, they came to a wide clearing. In the middle of the clearing was a large log cabin with a sign that said: GOOSEBERRY LODGE. Just outside the lodge, a bunch of kids and their parents sat on tree stumps arranged in a wide circle. Frank recognized Beatrice Lesser and Lina Kim, who were in the fifth grade at Bayport Elementary School. Frank, Phil, and Chet were nine years old and in the fourth grade; Joe was eight and in the third grade. The four boys and Mr. Hardy sat down on a row of tree stumps right behind Beatrice and Lina and their parents. Everyone was buzzing excitedly about the weekend. Beatrice and Lina were talking about their matching bright pink tents. A moment later a tall, lanky man in a gray-green ranger’s uniform came into the center of the circle. Everyone clapped as two older teens stood up and waved. The guy, Fish, was really tall and had spiky brown hair and chunky black glasses. The girl, Wendy, was really short and wore a navy-blue bandana over her messy red curls. “I’ve never met anyone named Fish,” Frank whispered to Joe. “Maybe his favorite food is fish sticks,” Joe joked. Ranger Gil proceeded to go through a long list of important camping rules. They included never using soap in or near streams or ponds and building fires only in existing fireplaces and pits. “Did you remember to pack our decorations?” Frank asked Joe in a low voice. Beatrice turned around. “You guys shouldn’t even bother. I’m totally going to win that contest!” she bragged.